Iskandar: Too many homes, too soon? Recent news about mega developments in Johor's Iskandar region has investors asking: Will there be an oversupply of homes? Perhaps. But no one knows for sure because no good data exists. It has been touted as an affordable real estate investment destination in an up-and-coming market, an attractive alternative to Singapore's pricey housing scene. But property buyers in Iskandar are now facing two big investor problems: a potential oversupply of homes and an inadequate supply of property data. The Iskandar region encompasses an area of more than 2,000 sq km in Johor. It covers the city of Johor Baru and the adjoining towns of Pontian, Senai, Pasir Gudang and the construction of a new administrative capital in Nusajaya. Mainland Chinese developers have been launching mega housing developments, with thousands of units each in the Malaysian territory, sparking fears that a supply glut might dampen residential prices and rents. THE Chinese trust company that nearly caused a "Lehman moment" for China earlier this year was in the news this month for another possible default - raising jitters once again about the world's second-largest economy's worrisome shadow banking sector. One of China Credit Trust's wealth management products that matures next week is running into problems as a coal mining company has failed to make fee payments since the second quarter of last year. This is rattling investors as the trust company had averted a default in January at the eleventh hour only when an unnamed saviour stepped in to lend a hand. The fear then was that a default would trigger a chain effect similar to the one after the 2008 collapse of the Lehman Brothers investment bank in the United States that led to the sub-prime crisis there and global financial turmoil. This was not being alarmist as China's huge shadow banking sector is considered by many to be a ticking time bomb. With a maturity peak likely next year for its US$1.9 trillion (S$2.4 trillion) trust fund industry alone, and defaults expected amid a slowing economy, it would be unwise to shrug off the threat. A rupture, if it happens, has serious implications not just for China but also for the global economy through its sheer size - at 46.7 trillion yuan (S$9.3 trillion) or about a third of the country's total credit. This means that 10 per cent of the world's corporate debt is exposed to the risk of a contraction in the sector, according to Standard and Poor's. The unruliness of the lightly regulated sector and the difficulty in taming it add to the problem. Shadow banking in China, ironically, burgeoned in the aftermath of the US sub-prime crisis caused primarily by such banking. To weather the global financial crisis that followed, the Chinese government unleashed a huge stimulus programme in which new credit weighed heavy on the banks. The government then allowed alternative forms of credit to grow, including trusts, leasing firms, credit guarantee outfits and money market funds, which tend to lend to firms with higher credit risks, such as those in troubled industries like property and steel. China has tried to rein in the sector with measures like curbs on interbank borrowing, which was one way of channelling funds to the shadow banking sector. But these have led to new forms of credit, including even online peer-to-peer lending. It is a conundrum Beijing needs to address squarely. Versatile capital markets must be encouraged and China has to also avoid a possible run on shadow banks. The consequences could be dire. Yet, looking the other way poses grave risks. It is a tricky task but for China and the world's sake, it must get the calibration right. CITIES known to be cycling-friendly share some common features, regardless of whether riding a bicycle is serious commuting or meant mainly for recreation. Top of the list are a dedication to safety by providing wide cycling paths segregated from busy roads, and adherence by cyclists to good riding habits. Sharing main roads with vehicle traffic is generally avoided: It is rare in Amsterdam and Copenhagen, rated the best cities for cyclists, where pedalling comprises a high one-third share of transport. Mild weather and a flat topography are advantages, of course. Contrary to belief, mega-cities choked with cars can also be safe for cyclists (Tokyo is one) but the infrastructure must be top-notch and there has to be mutual regard among road users. Singapore rates average in those descriptions. Many cyclists in the HDB suburbs show a disregard for basic safety, besides the perennial complaint heard about the bullying ways of car owners. That makes it all the more remarkable that Singapore has achieved reasonable success after years of promoting cycling as a park-and-ride supplement to public transport and as a means of making quick trips to the shops and eating places. If more schoolchildren are encouraged to cycle to school, it could help bring down obesity rates bugging this age group. It helps that the network of cycling paths that links up with transport nodes and neighbourhood schools is growing rapidly. Now the Land Transport Authority is considering starting a bike share scheme in locations that may include the downtown commercial and office area. A rental service obviates the need for casual riders to invest in a bicycle, which can cost a bit for a fancy model. Bike sharing as a community habit is common in some of the biggest cities in Europe, North America and Australia for local activities. In Singapore, the advantage could be cancelled out by the shift in mental gears that will be required. One difficulty is the lack of respect for shared communal property. There is also the prohibitive cost of building dedicated pathways in the city centre - if at all feasible - as sharing space with vehicles on main roads is not recommended. Serious accidents worldwide happen on open roads, seldom on dedicated lanes. To start with, the hire plan might be confined to suburban areas where the few hundred kilometres of existing and planned cycling paths form a ready infrastructural nucleus. Extras that will be needed include the hire-and-deposit stations to be dotted in HDB towns' commercial and recreational clusters, and safe connecting links across roads and junctions. These facilities would help give cycling a boost by making it safe, affordable, healthy, and even fun. Our columnist continues his monthly series of Big Ideas for the nation: Be happy for a year, when Singapore turns 50 next August. Celebrate Singapore's success - because there's practically zero chance of repeating that success in future. BIG Idea No. 6 will seem corny at first glance. This is why it is important to read to the end of this column, especially the last paragraph, to understand its full import. Here is the idea for my fellow Singaporeans: Let's decide to be happy for one year - from Aug 10 to next Aug 9, when it will be the 50th year of Singapore's existence. And why be happy for this one year? The reason is simple. We have had, by any standards, an extraordinarily successful first 50 years. The chances of us being equally successful over the next 50 years are practically zero. I will explain why later. Since we have had a good run and are about to embark on a more difficult run, let us rest and celebrate before the hard slog. A mountaineering metaphor comes to mind. We have reached a good base camp. Before we climb to higher and more difficult altitudes, let us drink teh tarik and celebrate how far we have come. Since so much has been written about Singapore's extraordinary success story, I will not dwell much on it. Our per capita income has gone from US$500 in 1965 to almost US$64,584 (S$80,253) last year, based on purchasing power parity terms. No other nation state can match this record. More importantly, we have had no conflict, at home or with our neighbours. Ninety per cent of our citizens live in homes they own. And we have wonderful education, health, civil service and military systems, and so on. To understand how well-off we are, just read the following aspirations of Indians after they elected Mr Narendra Modi as their Prime Minister. Mr M. J. Akbar, a well-known journalist, asks his fellow Indians: "Why cannot we have a simple home with a toilet for every Indian family by 2022? Broadband in every village? Electricity around the clock? A clean country, rid of garbage and filth that poisons life and nature, by 2019, as a tribute to Mahatma Gandhi on his 150th birth anniversary? These are not luxuries in the 21st century: they are bare necessities." We have achieved everything on his list and achieved it long ago. Yet, it is also clear that our citizens are tired of this success narrative. They remember only the difficulties of recent years: the surge of foreigners, the crowded Mass Rapid Transit trains; the long wait for Housing Board flats; the traffic jams on our highways; the soaring COE (Certificate of Entitlement) premiums and so on. Hence, instead of approaching our 50th anniversary in a jubilant mood, there are hints of a sour mood in the air. The goal of this article is to dispel the sour mood. PARADOXICALLY, the best way to do this is to tell Singaporeans that harder times are coming. First, since our track record in the first 50 years was so exceptional (even freakish by most historical standards), it will be impossible to match the same success. My generation has had it exceedingly good. And I experienced it personally. I went from a three-figure monthly salary in 1971 to a five- figure salary now. My children will not experience this dizzy climb upwards. Second, as I have said in earlier columns, we do not have enough land for each and every Singaporean to achieve the dream of the five Cs (car, condo, country club, cash and credit card). The last two we can all have. The first three we cannot all have. There isn't enough land to have millions of cars. Singapore already has one of the highest car ownership populations for a city; as of April, about 560,000 households owned at least one car each for a total of 605,184 cars. Nor can we build condos for each Singaporean family. And the land for country clubs is shrinking. Singaporeans therefore belong to a unique tribe: They have to deal with the existential angst of not having the land to fulfil their dreams. Third, we are losing, if we have not already lost, our first-mover advantage. We were the first to open up to global MNCs. Today every country does so. We were the first to set new global standards in services and logistics. Dubai Airport used to describe itself as a disciple of Changi Airport. But now our disciple has a much busier airport. In the past year, 67.3 million international passengers passed through Dubai, compared with 53.1 million through Changi. Indeed, Dubai is now No. 1 in the world for international passengers, surpassing even London's Heathrow Airport. Similarly, Emirates used to look up to Singapore Airlines for inspiration. Now it has become twice as big. In each area that we have excelled, we will have to deal with tougher competition. That's why the next 50 years will be a harder slog. So, let's celebrate this very special moment. And how should we celebrate? There will, of course, be many national parties in 2015. And we should participate in them heartily. But let us also celebrate at the individual level. Let us appreciate some unique and simple joys that all Singaporeans, rich and poor, can enjoy together. Let me cite some simple pleasures we can indulge in (and since we are celebrating our 50th birthday, I am using the number five in each category). FIRST, Singapore is one of the few developed countries where one can get good meals at less than $5 per head. It took a colleague of mine, who recently arrived in Singapore, to remind me of this exceptional gift we have. Mr Steve LaNasa used to be the president of Donnelly College in Kansas. Since coming to Singapore with his wife and two children, aged 10 and 13, in early January, he has been taking his children out to hawker centre after hawker centre. And he is absolutely amazed at the good-quality food you can enjoy in Singapore at such astonishingly low prices. He says: "Despite the fact that 'fast food' is ubiquitous throughout the United States, it's nearly impossible to find good, healthy prepared food at convenient locations, and what is available certainly isn't worth what you pay for it." Sometimes it takes a foreigner to remind us that we live in a food paradise. Why not indulge in this food paradise for less than $5 a head and toast Singapore each time we do so? SECOND, Singapore is fortunate to be situated in the most diverse cultural environment of our entire planet, South-east Asia. No other region can claim to have all the world's leading civilisations and religions living in relative harmony in such close proximity to one another. Many middle-class people from all over the world spend thousands of dollars to appreciate the special beautiful attractions of South-east Asia. [Yes they do. They like the warm tropical or sub-tropical climate of all these heritage sites. Singaporeans on the other hand, would like to go somewhere cooler. Not so humid. Secondly, while some tourists are drawn to cultural heritage sites, many others are drawn to Chattuchak, and Orchard Road. So for one year, let us stop dreaming of going to London or Paris, New York or Orlando. Instead, for less than $500 a head, we can experience magnificent historical sites and some of the most hospitable cultures on our planet. I hope that my next book will be on South-east Asia. Its tentative title is The Most Blessed Corner Of The World. We Singaporeans are truly blessed to be situated in the heart of this blessed corner. Let us enjoy it for one year very cheaply with $500 holidays. MY THIRD suggestion will be both controversial and difficult. It is very difficult to buy a decent- sized condo unit for less than $1 million in Singapore. Yet, we can buy a small home somewhere in South-east Asia for less than $50,000. Ultimately, this may be the best solution to the existential angst of living in Singapore. We can experience the freedom of space in our neighbouring countries if we cannot experience it in Singapore. In looking for cheap properties in rural areas, we will simply be emulating the normal behaviour of citizens who live in crowded cities and look for homes in rural areas in South-east Asia within easy reach via budget airlines. Let me add another truly outrageous suggestion. Why don't we encourage our rich developers, who have profited from 50 years of economic growth in Singapore to develop projects selling $50,000 homes in South-east Asia to fellow Singaporeans? The Government can also step in to help as it will make many Singaporeans happier. There are many problems with this suggestion. First whether Singaporeans will take to the idea. Well, some SC are already investing in Iskandar. So there are some SC who would go for a $400,000 bungalow. A $50,000 home...? Sure. Some SCs have placed their parents in nursing homes in Johor. Some SCs have set up a second home on Batam or Bintan. But many others have not. Is it because of money? The cost? The $50k idea solves the cost issue. But if there are other issues, $50k homes in and of itself, will not solve the problem. Especially if the homes are inconveniently located away from family, away from friends and social connections, away from the familiar, away from SG healthcare, away from the usual amenities. And why is happiness important? I believe that the most important goal for Singapore in the next 50 years will not be economic growth or political stability. Instead, it will be social resilience. Only strong social resilience will carry us through the inevitable stresses and strains Singapore will encounter in the next five decades. Happiness does not just help at the individual level. Happy societies are also more resilient societies. We have had a happiness deficit for some time. Let us party for one year and build up our happiness quotient. After that, we will be ready for the more challenging five decades coming our way. IN MY column on April 12, I wrote: "Hence, for 2015, when we celebrate our 50th anniversary, I hope that one of Singapore's philanthropists will award a $500,000 prize for the best history book written on Singapore." I am pleased to inform Straits Times readers that an anonymous donor has contacted me to support a project to promote a deeper understanding of Singapore's history in future generations of Singaporeans and the world. He has agreed to donate $500,000 for this Singapore history project prize. The money will go towards an endowment fund whose interest will be used to support a book prize every three years. He told me he became a Singapore citizen this year, even though he has lived here for many years. He would like to do something for Singapore. The writer is dean of the Lee Kuan Yew School of Public Policy, National University of Singapore. He was named one of the top 50 world thinkers this year by Prospect magazine, a British publication. Malaysia's oil hub: Will it be a threat to S'pore? TUCKED away in a corner of the south- eastern tip of Johor, a regional oil and gas hub is starting to develop in Pengerang. A world-class oil storage terminal officially opened near the small town last month. Pengerang is part of an ambitious plan launched in 2009 to build Malaysia's biggest refining and petrochemical complex. It has been earmarked as one of the country's key economic transformation projects and is designed to develop South-east Johor into a regional oil storage and trading hub. Pengerang will house oil refineries, naphtha crackers and petrochemical plants as well as a liquefied natural gas (LNG) import terminal and a regasification plant. There are also plans to build another oil storage hub about twice the size of Ang Mo Kio off Johor's Tanjung Piai coast near Jurong Island to capture spillover business from Singapore. At first glance, this seems to pose a threat to Singapore's own ambitions as a regional oil trading hub. But economists and industry experts mostly think that Pengerang will complement rather than compete with Singapore. Some analysts, however, are quick to point out that Malaysia would not be pouring in millions of dollars there just to get spillover business. The Gaza-based Hamas has recently fired more than 500 rockets at Israeli towns and cities. This has terrorised the citizenry, though it caused few casualties, in large part because Israel is protected by the Iron Dome anti-rocket system. In reaction to these indiscriminately fired missiles, Israel has bombarded targets across Gaza, killing more than 100 people so far. Compared with violent death rates in other parts of the Middle East, the number is small. (More than 170,000 people have been killed in the Syrian civil war to date.) But it is large enough to suggest an answer to Mr Abbas’s question: Hamas is trying to get Israel to kill as many Palestinians as possible. SINGAPORE - Temasek Holdings released its latest annual report on Tuesday, a colourful 104-page report packed with facts, figures and financial indicators. Temasek's net portfolio value - the total value of its assets - rose 3.7 per cent from $215 billion last year to a new record of $223 billion as at March 31. However, $5 billion of this increase was an injection of fresh funds from the Finance Ministry, Temasek's sole shareholder. Manpower Minister Tan Chuan-Jin and DPM Tharman Shanmugaratnam are scheduled to speak in Parliament on Tuesday, July 8. 1.32pm: Every country is concerned about how to help their people manage when they retire. While some argue that as individuals we should be left to sort our own lives out, in reality it often doesn't work out that way. Almost all developed countries have some form of pension or retirement system because most people generally don't save regularly nor do they effectively plan for their own retirement. For us in Singapore, assurance in old age revolves around a few key considerations: healthcare, housing and retirement needs. The CPF is our key pillar in the social security system. It is a mandatory savings account that helps us put aside money today to cover our needs in old age. 1.35pm: When the CPF was first introduced almost 60 years ago, members could withdraw their money at age 55 in a lump sum. That was because at that time, someone could expect to live only another six to seven years after that. The situation is very different today where one could expect to live a further 30 years or more. Allowing a full withdrawal from CPF at age 55 will put us at real risk of outliving our savings in old age. To blindly keep to the earlier model of full withdrawal at age 55 would be wrong and irresponsible. This is why we introduced the Minimum Sum scheme. The policy is not a new one and has been in place for about 30 years. The idea is to stream out our CPF savings every month to meet living expenses instead of having them all withdrawn in a lump sum. Neither do we need to set aside all our CPF savings to be streamed out in this way. Only a basic amount necessary for retirement expenses is required, and you can withdraw your CPF savings above that in a lump sum. This basic or minimum amount is known as the Minimum Sum. Medishield Life: Two articles on controlling costs. Yesterday, the MediShield Life Review Committee released its final report on Singapore's new national health insurance mechanism, giving specific recommendations regarding premiums. As expected, premiums will rise to cover the much extended coverage, although The Straits Times website described the premium rises as "much lower than feared". But while there are bouquets all round for the generous benefits offered, many trade-offs have to be struck to achieve a balance between affordability and coverage. The experiences of other developed places reveal issues that need to be addressed when implementing universal health insurance. One of these involves the integration of myriad voluntary insurance schemes. In South Korea, the process took almost 12 years and Taiwan over three years before its national health insurance scheme could be rolled out, and yet many bugbears in these systems are still being resolved. One has to admire the gumption of a small political party with no parliamentary presence that takes itself seriously enough to moot major national reforms. And so it is with the National Solidarity Party (NSP), which has just issued a paper proposing a constitutional overhaul of Singapore's 26-year-old Group Representation Constituency (GRC) system. NSP is tapping into public misgivings that have been around since the start of the GRC system. The unhappiness hinges on two perceived flaws. It took her more than 60 years of sweat and toil to squirrel away $400,000. But in less than half a day, Madam Goh Kah Keow, 74, lost her entire life savings to five con artists from China last November. Her case hit the headlines about a week ago, after two of the five Chinese nationals were jailed more than eight years in total for their heartless scam. The other three grifters remain at large. While many Singaporeans felt for Madam Goh, there were also those who wondered how an uneducated and unskilled worker came to have so much savings. EVEN as Singapore's fine-dining scene gains recognition, restaurants warn that the road ahead is only going to get bumpier. Apart from levies and quotas, many grapple with getting locals on board. A higher wage is not enough. Singaporeans want shorter hours and a "cooler", less taxing job. Last month, Tung Lok Group increased the pay for its waiting staff to between $1,800 and $2,200 a month, as well as benefits. But Andrew Tjioe, the executive chairman of the chain with more than 10 restaurants, told My Paper: "Even with this price tag, we do not get many people coming forward." He added: "We are not looking for people with high qualifications and we are definitely not choosy." POLITICAL freedom is not the only impetus for the hundreds of thousands of pro-democracy protesters who this week marched through central Hong Kong. True, the immediate cause was the Chinese government's recent efforts to assert greater control over Hong Kong. But that is not all of it, by any means. Tension between citizens of Hong Kong and mainland China has been increasing for several years now, metastasising into cross-border online shouting matches that have made strong impressions on people - and governments - in both places. ON JULY 1, the Japanese Cabinet decided to "reinterpret" its post- World War II pacifist Constitution by allowing the right to collective self-defence. This marks the end of Japan's self-imposed ban on military assistance to an ally under attack, and allows for the overseas deployment of the Japanese military. But while China and South Korea immediately condemned the decision, Japan's move should not be perceived as a deliberate attempt to destabilise the regional security environment. Rather, it is a reaction to the perception of a growing threat from North Korea and China. It is also in response to American criticism of Japan as a "free rider", benefiting from the security umbrella provided by the United States without providing anything in return. An Al-Qaeda breakaway group declared on June 29 a "caliphate" in territories it controls in Iraq and Syria. Leader Abu Bakr al-Baghdadi was named the "caliph" and "leader for Muslims everywhere". This excerpt, from an analysis by strategic security intelligence service Soufan Group, looks at the impact of this move on the Middle East and extremist movements. A CALIPHATE is essentially an administrative unit, but the caliph - as amir al-mu'minin, or leader of the faithful - also has religious authority as both the actual and symbolic leader of all Muslims. The declaration by the Islamic State in Iraq and Syria (ISIS) may seem far-fetched and even counter-productive in terms of maintaining and securing the secular alliances that it needs to continue its accretion and control of Iraqi territory, but it also plays to deep emotional strands within the Middle East, particularly in extremist circles. Should a promising chef stay in the kitchen or go to uni? The answer depends on how employers recruit and reward people. Paper credentials will always matter, if employers favour them over "deep skills". TWO years ago, I met a young graduate who had obtained an English language and literature degree through a private school here. Although she had graduated with honours and spoke good English, she couldn't even secure an interview when she applied to do a post-graduate teaching diploma at the National Institute of Education. Her degree wasn't good enough for the Ministry of Education. She was advised to try for a position as an "allied educator". We were in touch again recently. She had been accepted into several master's programmes in education overseas, including the prestigious Columbia University in the United States. She wrote to me: "Despite what the leaders tell us about second, third chances and valuing skills not exam results, the employers, including the Government, still look at your results, including your O- and A-level results, even though you may have a good honours degree from a good university. Is a balance of power in Asia possible, when the United States and China are locked in bitter rivalry? WHAT kind of Asia do we want to live in over the coming decades? Distinguished Singaporean statesman Professor Tommy Koh spoke for many when he wrote recently in these pages of "a balance of power in the region in which the US, China, Japan, India and the European Union are the five poles". Within that multipolar balance, he envisaged a relationship between the US and China in which they agree "to cooperate where their interests converge, to compete where their interests do not, and to manage their differences with maturity and wisdom". Prof Koh's vision of Asia's future is indeed a most desirable one, and I very much agree that this is what we in the region should all want. The question is whether there is much reason to believe that we will get it. Prof Koh made his remarks in response to views that I have presented in these pages which paint a rather gloomier picture of US-China relations. I take this gloomier view because, rather than moving towards an agreement to manage their differences with maturity and wisdom, I think we face a real risk that the US and China are being drawn into an increasingly bitter strategic rivalry. THE Central Provident Fund (CPF) has been in existence since 1955, and plays an important role in the lives of millions of Singaporeans. But this does not mean there is nothing to be learnt from asking some fundamental questions about its usefulness. Why, for example, do practically all developed economies have social security systems? Why is the CPF fully funded by contributors? In this article, I seek to answer such questions. I also try to explain why, in the current circumstances, CPF-style social security systems generally work better than systems that are fully funded by the government. 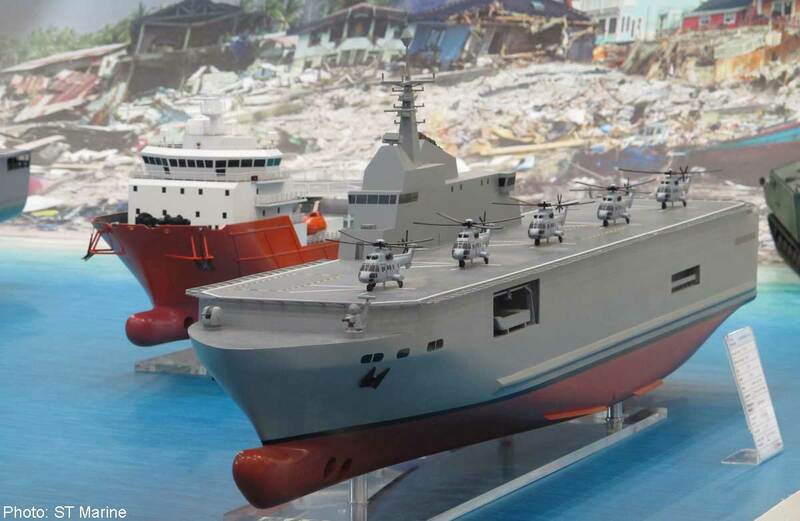 The larger joint multi-mission ship that the SAF is likely to buy is similar to the Endurance 160 (model above). THE Singapore Armed Forces (SAF) is likely to acquire a bigger warship that can carry more helicopters as it looks to expand its role and do more in the world's potential flashpoints, said Defence Minister Ng Eng Hen. [Ideal. But realistic? Given perfect information, any one with a reasonable amount of intelligence, experience, and training can make the right choice. But generally, chaotic incidences does not lend itself well to accurate information. The picture on the ground, is dependent on the ground officers providing information, and that is still filtered through the officer's perception, coloured by his emotions, and framed by the circumstances. An insidious trend has developed over this past third of a century. A country that experienced shared growth after World War II began to tear apart, so much so that when the Great Recession hit in late 2007, one could no longer ignore the fissures that had come to define the American economic landscape. How did this "shining city on a hill" become the advanced country with the greatest level of inequality? One stream of the extraordinary discussion set in motion by Thomas Piketty's timely, important book, Capital In The Twenty-First Century, has settled on the idea that violent extremes of wealth and income are inherent to capitalism. In this scheme, we should view the decades after World War II - a period of rapidly falling inequality - as an aberration. This is actually a superficial reading of Piketty's work, which provides an institutional context for understanding the deepening of inequality over time. Unfortunately, that part of his analysis received somewhat less attention than the more fatalistic-seeming aspects.